It is unlawful for any trap to exceed a volume of 22,950 cubic inches. Escape vents are required in order to allow sub-legal sized lobsters and other non-targeted species to leave the trap. Escape vents must be unobstructed. Circular vents are preferred for retaining crabs. One or more rectangular escape vent or two or more circular escape vents shall be placed on a side of the parlor section of the trap and are typically affixed with hog rings. While a particular orientation is not mandated, certain orientations enhance escapement (see Escape Vent and Ghost Panel Placement). If your trap has two parlors, both areas must be vented. Gulf of Maine Recreational Lobster/Crab Area. Rectangular escape vents must measure at least 1 15⁄16″ by 5 ¾” or two circular vents must measure 2 7⁄16″ diameter. Outer Cape Cod or Southern New England Recreational Lobster/Crab Area. Rectangular escape vents must measure 2″ by 5 ¾” or two circular vents must measure at least 2 5⁄8″ diameter. Ghost panels are designed to create an opening to allow the escapement of lobsters and incidental catch within 12 months after a trap has been lost or abandoned. Panel size. The panel must be rectangular and measure at least 3 ¾” x 3 ¾”. The panel may be your escape vent or trap door. Panel location. 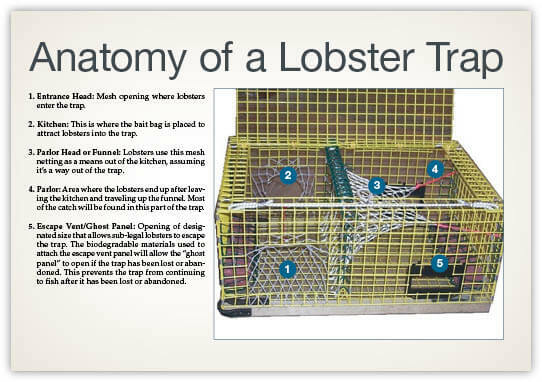 The panel must be located in the outer parlor section of the trap and in a position which allows unobstructed exit of lobsters. The panel should not be located on the bottom of the trap. Panel fastners. The panel – or the trap door or escape vent if being used as a panel – must be fastened to the trap with one of the following materials: cotton; hemp; sisal or jute twine not greater than 3/16” diameter; or non-stainless, uncoated ferrous metal not greater than 3⁄32″ in diameter. Wooden traps. Traps constructed entirely or partially of wood shall beconsidered in compliance if constructed with wooden lath to the extent that deterioration of the wooden component(s) will result in an unobstructed opening of at least 3 3⁄32″ by 3 3⁄32″. Your buoy lines are the lines that connect your pots to their surface buoy. While swimming through the water column large whales, porpoises and sea turtles may become entangled in these lines. 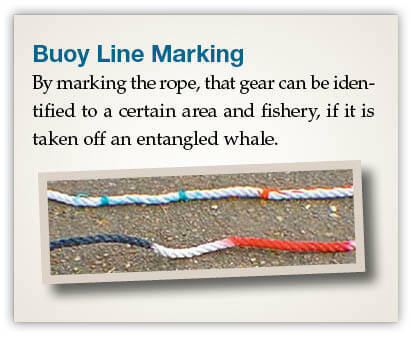 As Massachusetts provides important waters for these species, your buoy lines are subject to certain requirements to reduce injury and mortality associated with entanglements and to identify entangling gear. The top 2/3 of all buoy lines must be comprised of sinking line. The bottom 1/3 of the line which may be floating line, if so desired. Sinking line has a specific gravity that is greater than or equal to that of seawater (1.03) and does not float in the water column. All buoy lines must have a diameter that does not exceed 3⁄8″. 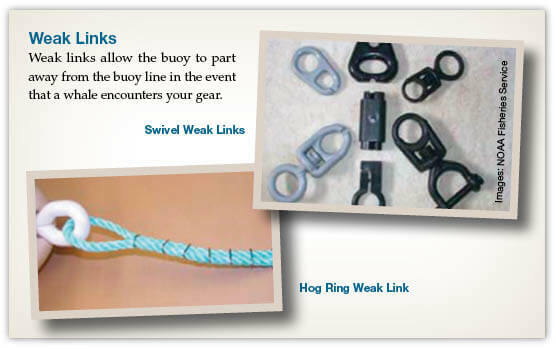 On the top of the buoy line before the buoy, all lines must have a breakable section (weak link) that will part when subjected to 600 pounds of pull pressure and after parting will result in a knot-less end, not ticker than the diameter of the line (see image). Mid-way on the buoy line there must be a 4″ red mark. If the buoy line is red, then a white mark may be used instead. Common marking tools include tape and paint (see image). If fishing trawls, the groundline that connects each pot must be sinking line (see image).